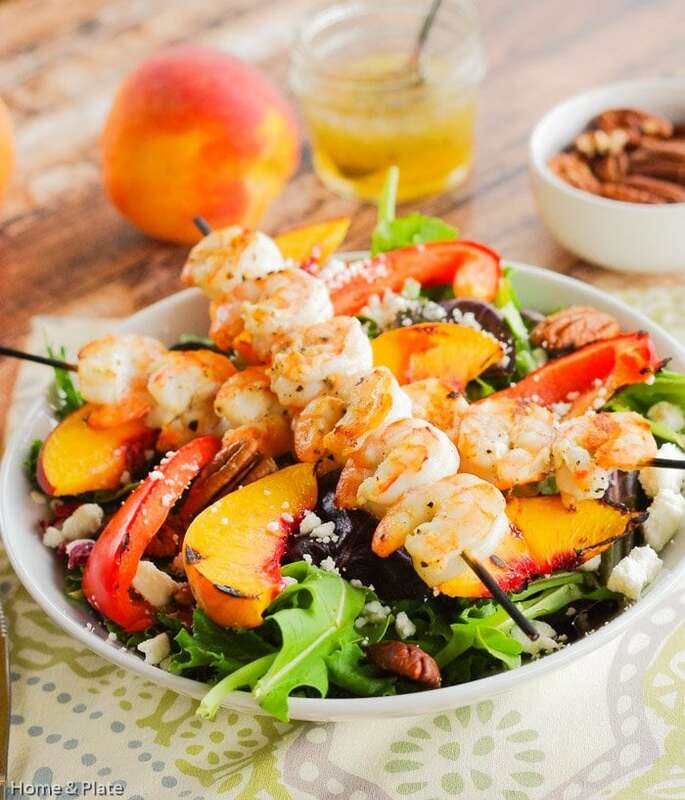 Make up this shrimp & peach salad with goat cheese for a light summer dinner and add a drizzle of honey balsamic vinaigrette dressing on top. I discovered that grilled peaches and shrimp go beautifully together. This salad dotted with goat cheese and pecans and drizzled with a honey balsamic vinaigrette is a winner. The grill has been my friend this summer. I’ve enjoyed grilling fruits especially peaches because it brings out a sweet, caramelized flavor to whatever you add it to. Shrimp is always succulent off the grill. Put the two together and you have an amazing combination of flavors. My husband was hesitant to eat shrimp and peaches together. Being a meat and potatoes boy he was pleasantly surprised. “This taste great” where his exact words. 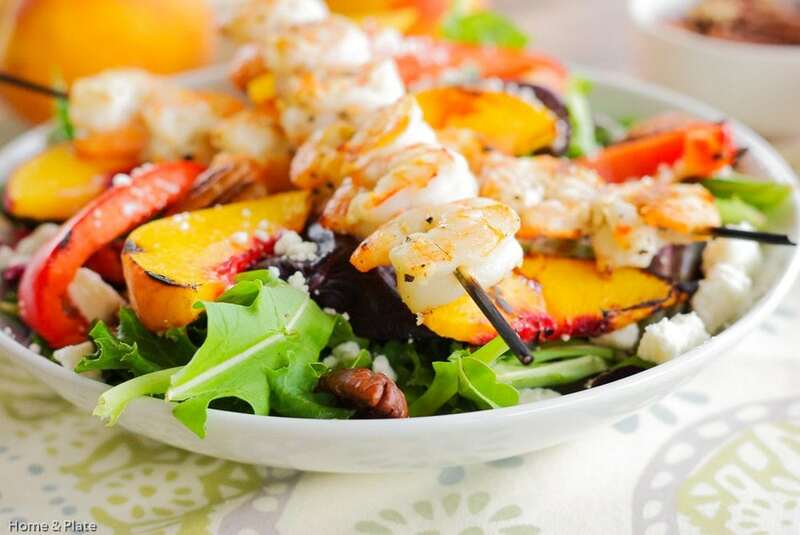 This shrimp peach & goat cheese salad is the perfect healthy choice. It’s low in calories, high in protein and packed with flavor. 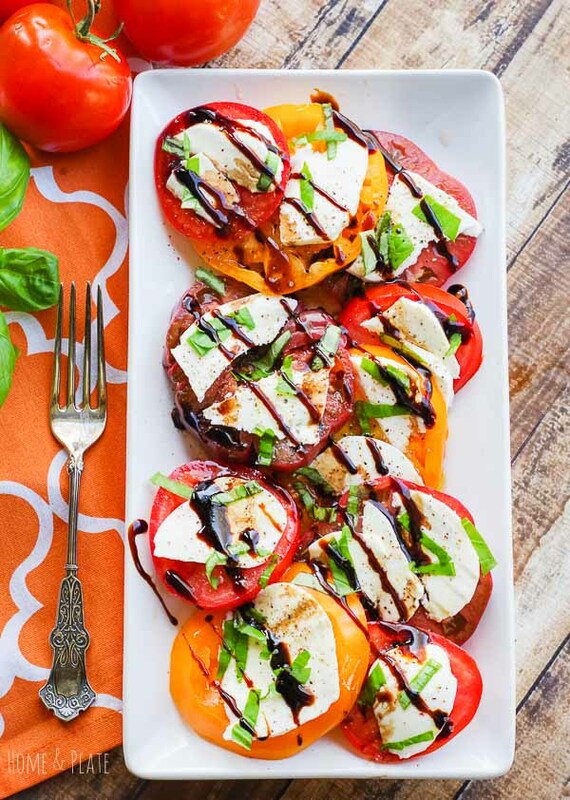 Mix up your own honey balsamic vinaigrette and there is no guilt eating this summer salad. Make up this shrimp peach & goat cheese salad for a light summer dinner and add a drizzle of honey balsamic vinaigrette dressing on top. Heat the grill to medium. Thread the shrimp onto wooden skewers. Drizzle the shrimp with olive oil and add salt and pepper to taste. Grill the shrimp on both sides for a total of 3 to 5 minutes and until pink and cooked through. Thread the sliced peaches and red peppers alternately onto wooden skewers. Grill for a total of 6 to 8 minutes or until the peaches and peppers are slightly soft. Remove the peaches and peppers from the skewers and set aside. In a small jar whisk together the olive oil, balsamic vinegar, honey, salt and pepper. Arrange the lettuce mix into bowls. Arrange the red peppers and peaches on top of each salad. Next, top with pecans and goat cheese and the shrimp skewers. Drizzle the vinaigrette over the salad and serve. Wow Ali! I think this has to be the prettiest salad I’ve seen all season. Gorgeous and bright, I love the shrimp and peaches together. Would love this on my plate for lunch or dinner! Such a sweet compliment Allie. I appreciate it. 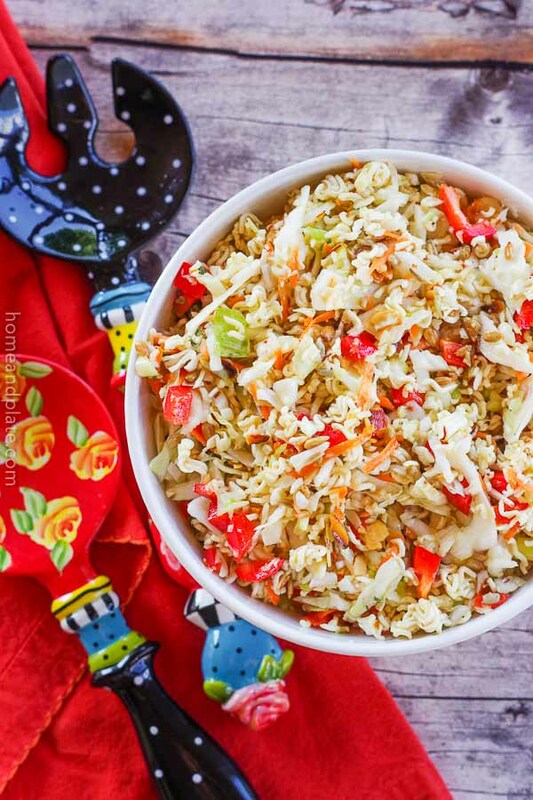 It’s the perfect salad for lunch or dinner. Oh my, I think the combination sounds wonderful! I love a great salad!! Thanks Debra. The combo was a winner. So tasty! What an interesting combination, I wouldn’t have thought about putting peaches and shrimp together. It looks delicious! Thanks Marye. The flavors are fantastic together. I agree with you Heather. Thanks! This is such a pretty salad. 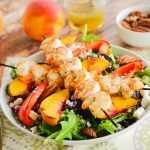 I love adding goat cheese to my salads and with the added peaches and grilled shrimp, I’m sure this tastes delicious!! Thanks Joanie. I am a big fan of goat cheese too. 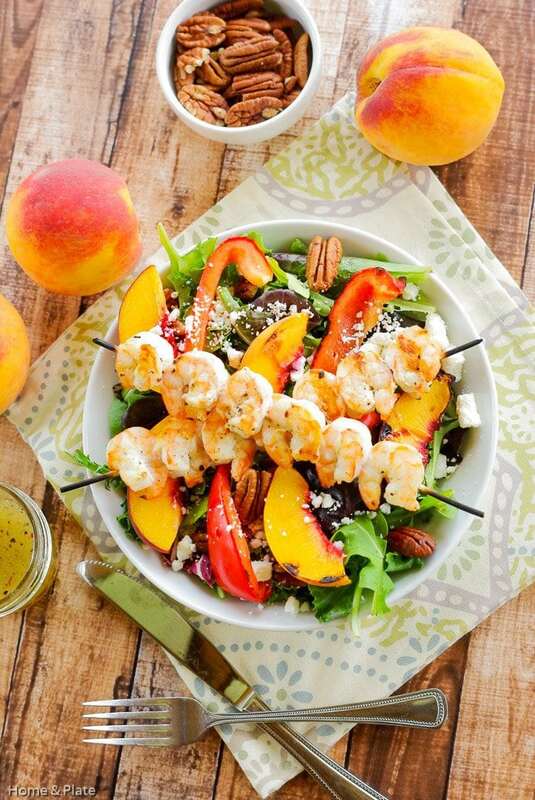 Oh my goodness, who knew shrimp and peaches paired so well? I just so happen to have both right now! Dinner is served! Gwen. It really does make the loveliest combination. I hope you enjoy.